Well folks, here are my blocks for Karen. These X and Plus blocks have always bewildered me. It is hard for me to understand why they are such the rage these days. Perhaps it is because they seem so random but so many of my good friends LOVE them and can't get enough. The beauty of quilting, we all have our own style. 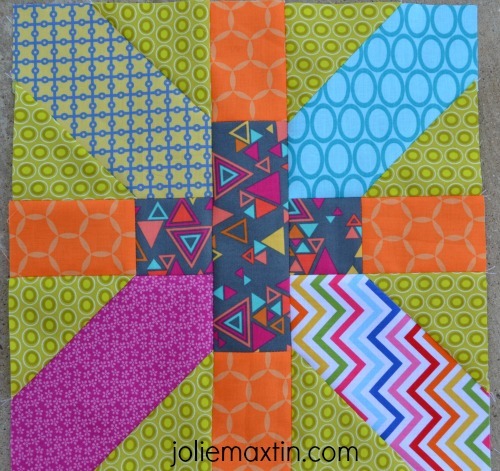 I was shocked at how obvious the background fabric was when the blocks all were finished, but that's ok - now I know! You're not alone in your bewilderment, I've heard that same sentiment from others who can't quite relate to the utter chaos and massive amount of visual stimulation of scrappy xPlus. I love both of my blocks - thank you for making them even if you don't "get it" LOL. I agree... I find them to be chaotic in prints, but like them in solids. It is a phase, though, just like the scrappy trip around the world, I don't like them either. There is a fun part of blogging that is about being a part of what others are doing and that is also the fun part about quilting. Take one pattern and have a bunch of people create a quilt from it and you get a bunch of different quilts, depending on the fabric chosen by each quilter.